T.R. Balamani, well known Carnatic music guru, who trained several star musicians, passed away in the morning on 30 October 2014, in Chennai. She was the recipient of several awards including the first M.S. 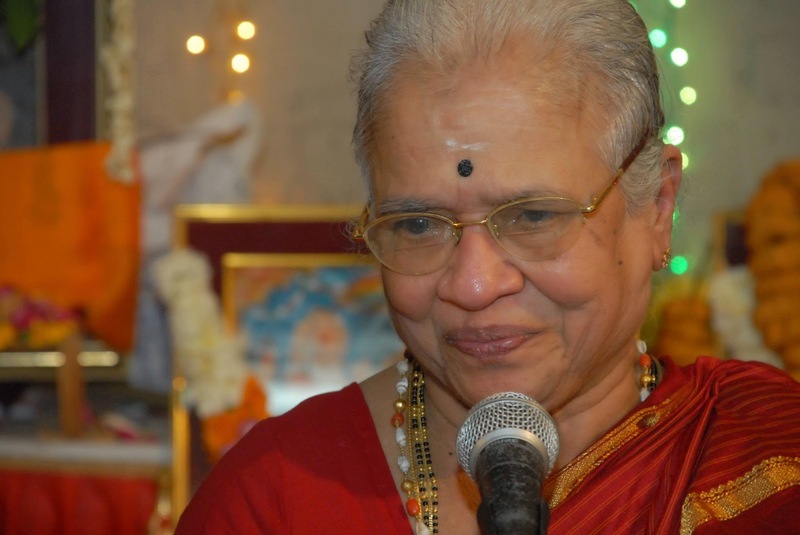 Subbulakshmi Lifetime Achievement Award from Sri Shanmukhananda Fine Arts, Mumbai; the TTK Award from the Music Academy, Chennai; and the Acharya Rathnakara title from the Tyagaraja Aradhana Committee, Cleveland. 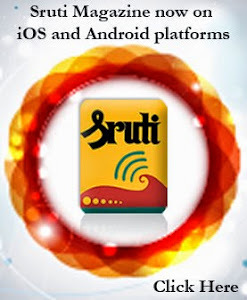 Sruti offers its condolences to the bereaved family. It must have been an unusual experience for Kalanilayam, the oldest Tamil theatre group, when it decided to choose a totally different subject for its play before the Chennai audience last weekend. It was a period play on the life of saint-poet Tyagaraja, who lived around two hundred years ago, and his immortal songs in praise of his beloved Sri Rama. Backed by the 98-year old doyen of Tamil theatre, K.S. Nagarajan (who was honoured with a life time achievement award by Ramu Endowments before the play), his son playwright and actor-director K.S.N. 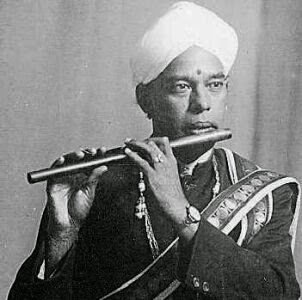 Sundar donned the role of Tyagaraja, besides scripting the dialogue. The play featured episodes based on short stories by the late Swaminatha Athreya of Tanjavur, a scholar writer of the Manikodi era. The stories were published some sixty years ago in Swadesamitran, based on his conversations with the disciples of Umayalpuram Swaminatha Iyer and Embar Srirangachariyar, who learnt directly from the saint-poet. 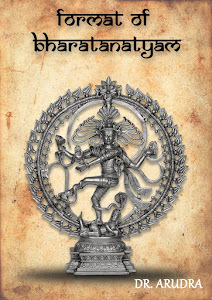 Of the more than 25 stories originally published, only a dozen were available now in the book ‘Tyagaraja Anubhavangal’. Every one, however, is a gem. The play had eight episodes chosen strung as homage to the bard of Tiruvaiyaru. It began with a scene in which Tyagaraja is invited by Natesa Achari to witness the Ramayana play being staged by them in the threshold of the field in the night. Overwhelmed by the impact of the street play by commoners, Tyagaraja embraces the actor who plays Rama as well as Natesa Achari who plays Hanuman. The commotion created by the abduction of a young girl Ganga by the palace people and the resultant riot averted by Tyagaraja was another scene which had all the ingredients of drama. In another, poignant scene, the temple priest is accused by the rogue Eknath of stealing the golden flowers meant for the archana, Tyagaraja heaves a sigh of relief when the gurukkal reveals the truth that exposed Eknath. The roles of Tyagaraja’s disciple Ramaraya and Jalpesan, Tyagaraja’s brother, were clearly etched and provided mirth and laughter in an otherwise serious play. ‘Kalanilayam’ Chandru did the role of Ganapadigal and Upanishd Brahmam with his customary ease, underplaying the roles. The majestic Kakaji Panditar, an official from the palace, the gigantic tantric who brings cheer to Jalpesan for his scorpion bite and Ganapadigal’s garrulous friend Krishnamurthy Sastrigal, were perfect foils. The play had the advantage of wonderful vocal music by Sikkil Gurucharan which added strength and substance to the whole play. The kritis chosen were contextual and Gurucharan rendered them with feeling. KSN Sundar not only scripted the play but also took up the challenging role of the saint-composer. His body language and dialogue were close to perfection. The humour in the dialogues was naturally woven into the play. From family dramas to a classical play of this kind, Kalanilayam has come a long way and it must have been a paradigm shift in their approach to sabha theatre presentation. On the whole, a well produced play Anubhava Aradhanai is booked for a dozen shows in the city as of now and should reach out to many venues in the coming months. A suggestion to the Sabha authorities: While celebrating the Tyagaraja Aradhana Day, why not stage Anubhava Aradhanai in the evening for the pleasure of the rasikas? 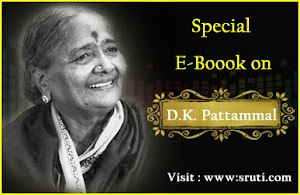 They would not only get to hear the wonderful music of the composer, but also watch the events unfold before them on the stage leading to the birth of the kriti-s.
Rasikas.org, a popular website on Carnatic music, counts being rasikas as well as musicians as its members. Some of these have instituted a Tambura Welfare Fund to help the needy among tambura artists and technicians, contributing their own funds. 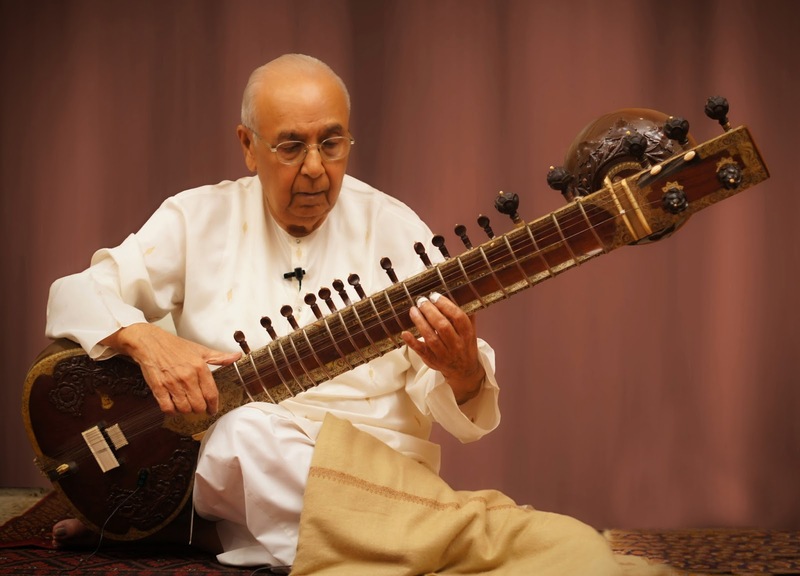 Chitravina Ravikiran and his family have extended their support to this worthy initiative, and KN Sashikiran has included it as part of the Carnatica Archival Center, a Trust launched in July 1999 "to preserve, promote and propagating Carnatic music globally." Towards this end, leading vocalist Aruna Sairam has consented to perform for a fund raising benefit concert, as a part of Bharat Sangeet Utsav-2014 of Carnatica . Aruna Sairam’s concert will take place on Sunday, 2 November, 2014, at Narada Gana Sabha Hall. 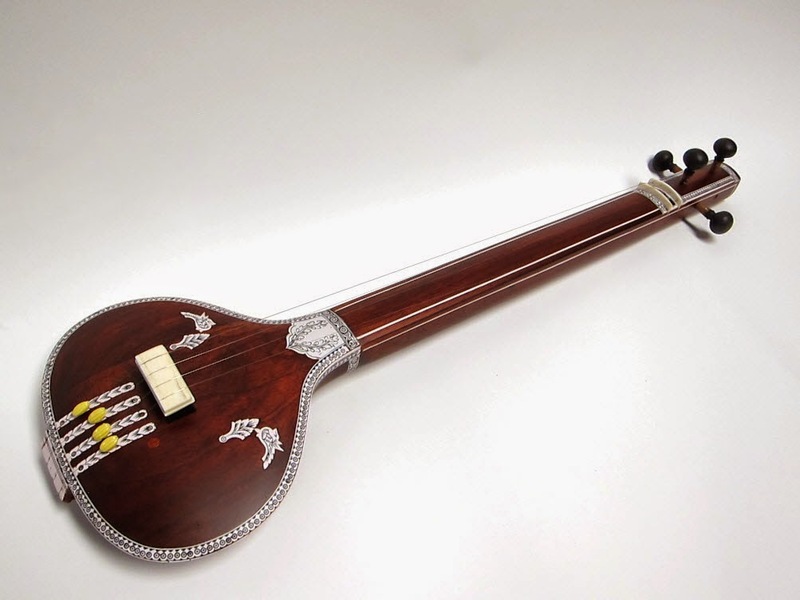 The proceeds of the concert and contributions by members of rasikas.org will go to meet the critical needs of tambura artists and technicians at Chennai, Bengaluru, Hyderabad and Tiruvananthapuram. CAC-TAWF (Carnaticxa Archival Centre-Tambura Artists Welfare Fund) appeals to rasikas, patrons, sponsors, corporate, foundations and institutions with an interest in Carnatic music to contribute liberally to the fund. CAC is a Trust and donations are exempted from tax. Please send your cheque/demand draft in favour of Carnatica Archival Center, New No:12, Dwaraka Colony, Mylapore, Chennai-600004. E-mail Id: carnaticamusic@gmail.com. Please also send a note along with the cheque/draft, 1.Name.2.Address.3.Contact details.4. Cause-CAC-T.A.W.F. Two weeks of tireless efforts enabled me to get in touch with the celebrated scholar during my recent visit to the US and send a copy of the book Ramadas & Thyagaraja, the fourth edition of which was released during this year’s Tyagaraja Aradhana Utsavam on January 14, 2014. Despite being busy shifting to a new place Prof Jackson graciously replied to my mails and lyrically acknowledged receipt of the book. I cannot thank him enough for sparing his time to reply to my mails. But I have pleasure in publishing his generous replies, with his kind permission. Thanks for your kind words regarding my work on Ramadas and Tyagaraja. It was a privilege to spend time studying those great devotee-composers. 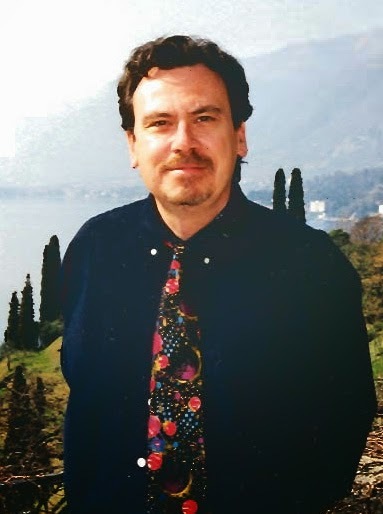 My retirement from IUPUI began a few years ago and I am in the midst of buying a house in another part of the country, and selling the house I have lived in for many years, and packing and attending to some family matters in Illinois as well, so this is an especially busy and hectic time. It would be wonderful to read your book. This is a beautiful book, and I can see that a lot of care and thought has gone into the making of it. I admire the work you have done in the beautiful book. I remember fondly going to Bhadrachalam with Rajanikanta Rao, and also learning from TS Parthasarathy in Madras about Ramadas and his lyrics, while studying Tyagaraja's lyrics. hearing of this the king was furious, imprisonning him. when he spent the king’s money on Shiva worship instead. and took them to the king to pay Manikka’s debt to him. who got themselves in crises and had their Lord rescue them. A small but important initiative was launched on the premises of the University of Pune in August on the eve of Ganesa Pooja in the historic city of Pune. It was a two-day national seminar on dance criticism, much needed to revitalise the dying genre of dance writing. India has the dubious distinction of having thousands of dancers and dance recitals but few competent dance writers. The rapidly shrinking space in the media has further contributed to the much marginalised genre of dance criticism. Against this depressing backdrop, the seminar that was timely, generated rave responses. Titled “Dance Criticism: macro and micro perspectives”, the well-designed and well-executed seminar was the brainchild of the famous city-based Bharatanatyam exponent Sucheta Chapekar, who was earlier the head of the performing arts department of the University. The idea was wonderfully translated into action by the young and dynamic Assistant Professor of Dance, Parimal Phadke, who was ably supported by a large number of involved students of the dance department. Spread over four sessions, the two-day seminar featured four focus groups – critics, editors, dancers and readers – with interludes of intense interactions and questions-answers in between two sessions. While the critics group comprised Sunil Kothari, Leela Venkataraman, Manjari Sinha, Veejay Sai and Shyamhari Chakra, the editors group had Ashish Mohan Khokar of the Dance Attendance annual, Lalitha Venkat of narthaki.com, K.K. 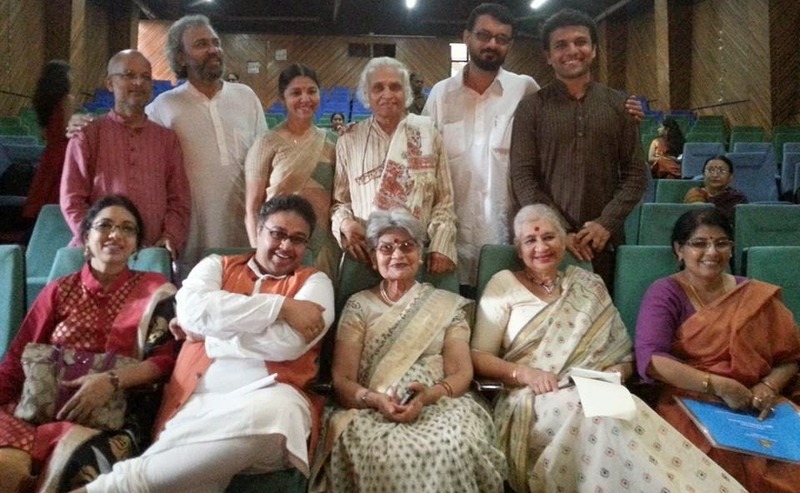 Gopalakrishnan representing Nartanam dance quarterly, and Shumita Mahajan of Pune who served a major English daily. Similarly, the dancers-scholars segment included Sucheta Chapekar, Shama Bhate and Roshan Datye – all from Pune, Chetana Jyotishi, former director of Kathak Kendra, New Delhi, and Jayashree Rajagopalan, Bharatanrityam exponent from Mumbai. The readers group featured presentations by Jyoti Tilak with a background in library science who teaches at a finance and management institute in Pune, and Neela Sharma, a senior journalist with a regional newspaper. Setting the tone of the deliberation, globe-trotter Dr. Sunil Kothari termed dance criticism as a “thankless task” in India today. Explaining it as a post-colonial concept that arrived in India along with the British rule, he presented a panoramic picture of the “systematically killed” dance criticism scene in Indian mainstream media down the decades. The job of a dance critic demands sound knowledge of literature, Sanskrit, technique of dance styles and familiarisation with Natya Sastra apart from constant exposure to dance performances, he emphasised. In conclusion, he said, “I see a bleak future for dance criticism in India and I don’t see any reversal in the trend”. Deliberating on “Terminologies in dance criticism”, Leela Venkataraman referred to the “jargonising writing” that the readers often come across – classical, traditional, experimental, modern, innovative – to explain how it poses a great deal of difficulty for a dance writer to analyse a particular genre of dance. Referring to the works of Chandralekha, Swapnasundari’s Vilasini Natyam, Bengal’s Gaudiya Nritya and Odisha’s Mahari dance, she lucidly explained how ‘convention’ is being confused with ‘tradition’ by the critics and connoisseurs at times. “The approach to dance has changed completely and hence the whole mindset needs to change for appreciating and critiquing dance. The critic has to be vivid in conveying the essence of the dance and has to find out an apt language to appropriately explain changes taking shape in the dance genres”, she pointed out. Manjari Sinha’s presentation – the relevance of content in criticism – emphasised how a critic must be a ‘connoisseur’ and ‘compassionate’ besides being aware of the essence of the arts form to be able to help the readers to appreciate the arts tradition. Initiation into the art form – that a critic deals in – is immensely important, she felt. This writer presented a paper on “Dance criticism in Indian mainstream media today – a journalist’s perspective’. Drawing from my own experiences and admitting the challenges aspiring dance critic encounters in India, I hinted at the many ‘hitherto unexplored opportunities’ for a dance writer like research, documentation and writing books on dance. I said that a dance writer need not be confined to classical dances but should write on the numerous folk, tribal and ritualistic dances that India boasts of. Veejay Sai’s presentation on “The role of a critic as a catalyst for art and culture” defined how “a critic is nothing but an involved audience and a catalyst” as well. Referring to “the Victorian model of criticism”, he observed that arts criticism has not yet come up in India to its desired level. The findings from the editors’ focus group offered much hope for dance criticism through an alternative media – journals, periodicals and web portals – in view of the rapidly disappearing space for dance in mainstream media. Ashish Khokar shared his experiences through his presentation on “Making space for dance – the Attendance model”. Born out of his illustrious father the late Mohan Khokar’s “idea and inspiration”, the year book has finally become financially viable following 15 years of struggle for survival through hard and good work, he acknowledged. The editor should never be judgemental and yet has to take a stand, he emphasised while stating that “editing is an art”. Representing the 14-year-old Nartanam quarterly dance journal being published from Hyderabad, its honorary editor, Kerala-based K.K. Gopalakrishnan described the challenges of bringing out the journal in the absence of support from subscribers and advertisers. He made an important observation and a refreshing remark: “The readers’ opinions are as important as of the critics. The critic is a mere instrument in initiating an aesthetic dialogue between the dancers and the audience”. The wit-laced, lively presentation of Lalitha Venkat, content editor of narthaki.com since its launch 14 years ago, was an eye-opener. The saga of success of this web portal from a mere address bank on Indian classical dances to the most visible web-magazine on Indian classical dances today has made it “a democratic forum for dance writers, readers and dancers”, she said. One of the rare advantages of the web-magazine has been the facility to modify the contents even after being published apart from its no-space constraints and access to the website from any part of the world. Shumita Mahajan’s presentation, ‘In defence of media’, revealed how advertisers come ahead of the readers in the mainstream media today and how the editors have been sandwiched between the commercial motives of the management and the expectations of the critics and readers for more space in an era when “the voice of the media has been silenced”. The session of a dancers-scholars focus group on the following day emerged as a healthy dialogue – and not a duel – with the critics and editors who, on the previous day, had blamed a section of the dancers for not tolerating dance criticism and for not supporting dance publications as readers and buyers. In her presentation “Reflections of a dancer”, Sucheta Chapekar maintained that “the critics’ views should be taken seriously” while making an appreciative assessment of the presentations made by all the critics and editors. She, however, pointed out that the use of language in criticism matters a lot to dancers. The younger generation dancers feel discouraged by negative reviews, she indicated. Kathak exponent Shama Bhate’s paper on “Subjective criticism” emphasised the “holistic evaluation of dance as it is a composite medium”. She lamented the lack of national level presence of dance criticism and publications. “No more do we get to read the review of a performance across India in any newspaper as it used to be earlier. Coverage of dance events has gone regional and hence there is the need for more of national level publications”, she felt. Roshan Datye, another Kathak exponent from Pune, emphasised on dancers getting into dance criticism. Presenting a panoramic picture of the dance criticism scene of Pune down the years, she regretted that “rarely do we come across a dance critic who has due understanding of more than one dance form”. Jayashree Rajgopalan’s narration of her guru Padma Subrahmanyam’s sweet-sour experiences with dance critics spanning over several decades made an interesting presentation. Her narrations revealed how critics and dancers can complement each other in pursuit of knowledge and in the service of dance. The most poignant presentation of the session was, however, by Chetana Jyotishi who, extensively quoting Bharata Muni from the Natya Sastra, lucidly explained the qualities of the critic and of the audience. Being a critic means bearing a big responsibility and therefore the critic has to a unbiased, hard working, with the ability to surrender ego, willing to learn and enquire apart from acknowledging the source of the knowledge. The presentation by the readers focus group during the concluding session had Pune-based senior journalist Neela Sharma who put forth her views in Hindi as “aam darsak, aam pathak” (common audience and reader) in her presentation of “Sameekshyaki upekshya kyon!” (Why negligence of criticism!) in which she gave a bird’s eye view of dance criticism in Maharashtra. There are only reports on dance and no reviews, she lamented and reminded how Pune’s late luminous dance personality Rohini Bhate used to write in mainstream media on dance in Marathi in an attempt to reach out to the layperson. Jyoti Tilak, the other reader with a background in library science, made a very informative and articulate presentation which was a useful guide to access the world of publication of books on dance. The keynote address on “Introduction to criticism” was offered by Rekha Sahni, an expert on literary criticism. 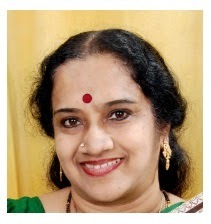 Well known Carnatic vocalist Geetha Raja has been selected to receive the Dr. MLV Memorial Award instituted by CMANA (Carnatic Music Association of NorthAmerica), U.S.A.. The award will be presented during the inaugural function of the Music and Dance Festival of Narada Gana Sabha on 13th December, 2014 at the Sathguru Gnanananda Hall, Chennai.